Computex is becoming less and less important. That's what Acer, a Taiwanese origin producer thinks, thinks that it's better to place your own event and display all messages at once. That's what they did in New York, where they presented us with the latest laptops from the Predator and Nitro series, as well as the emergence of ConceptD, a new brand focused on professional designers. Acer is presented as the No. 1 brand in gaming devices, mainly due to the 50% increase in the demand for the Predator range. According to the company's data for 2018, the Sector of gaming equipment was the fastest growing, with 70% in the category of gaming computers for Asia. However, Gartner's data from April 2019 show panorama, where the general computer market fell by 4.6%, Acer is the group that suffered the most compared to the previous year with 13.6%. In the midst of this situation, Massimiliano explains that the brand is bets on games as a way to increase the value of each unit soldAlthough he does not give numbers and percentages of computer games in Europe, he says that "the contribution to income compared to the amount is more than twice". Acer laptops include the latest market components, such as the ninth generation of Intel processors or NVIDIA RTX graphics. From the sign they explain to us that they had the opportunity to bring the Acer Predator Helios 700 ahead of time, but decided wait a few weeks for the appearance of the latest Intel chips. It's a logical decision, but when we asked Massimiliano about AMD, his position changes radically"In previous years, we used AMD about 10-12% of our products, but as everyone knows, unfortunately from the third quarter of last year, the situation is not so good." It refers to various problems with AMD chipsets and logistical difficulties. "If we ask for ten, they can not give us eight, and after nine. We had a problem with the amounts they promised, and this prevents us from giving a good answer to our consumers. " He continues to refer to Intel: "On the other hand, we have a manufacturer with a product with excellent performance, good price, good platform and excellent response when we report problems." "We want to offer the best cooperation, and in 2019 two platforms will co-exist in our catalog." Coexistence that they think will be continued and where they are detected an increase in demand for AMD"The presence may increase, but not because we want to do it, but because we want to respond to this demand." In Europe in February this year, the AMD market in Acer was around 13-15%. "We are compatible with the market," says Massimiliano. "We do not believe that AMD offers great value to enthusiastic players." Another point where AMD does not convince producers such as Acer to the highest class in the sector of the most demanding players. "For a more casual player, AMD offers a great solution, but we do not think it offers great value for super enthusiastic players, but the reality is that when you do CPU tests and performance tests, players do not care about the color of the processor." 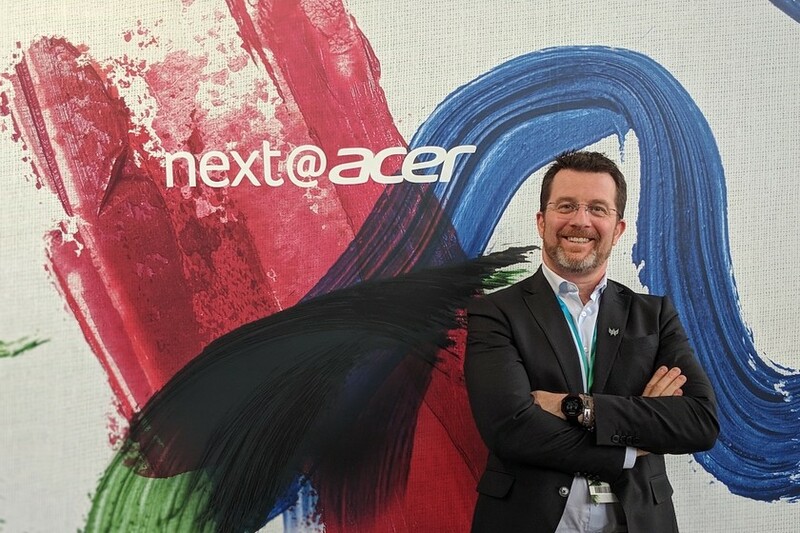 Last year, more or less at the same time, Emmanuel Fromont, president of Acer EMEA, told us that "innovations in PCs will focus on the battery and" always on ". This year, the company is focusing on anotherWe have moved from a catalog of convertibles and portable devices to a catalog where games are stronger than ever with the consent of ConceptD. And what are the features that make Acer different from other manufacturers? According to Massimiliano Rossi, "We have a unique construction and a perfect thermal solution thanks to our Aeroblade fans"This obsession with maintaining low temperatures is visible in Helios 700, which has a sliding keyboard to further improve this aspect. "This is a kind of innovation that I think distinguishes us from others, except using one or another graphics processor and processor." "ConceptD is our new basic product"
If you had to keep a single product, what would it be? We asked Massimiliano. "I think I would stick to ConceptD 5Acer has presented a new range of products this year, and the prices and type of users are even more demanding than in the case of Predator, ConceptD is in the form of laptops, desktops and monitors, all designed for professional designers and top-level specifications. "We want to offer something new on the market for those who seek maximum power, but do not want to sacrifice design." ConceptD has products at reasonable prices for most users, but it is not intended for all customers. In fact, ConceptD will not be offered in retail and It will be sold directly to companies and professionals. "We want to offer something new on the market for those who seek maximum power, but do not want to sacrifice design." Among all the aggressive looking laptops ConceptD 5 is a thinner notebook with an attractive, frosted white design that hides interesting internal functions. Here, Massimiliano chooses the most economical model, which instead of including powerful RTX 2080, like ConceptD 7, contains Radeon RX Vega M GL graphics. After testing for several hours, ConceptD's laptops could be understood as An attempt to compete Acer with Apple MacbookWe are facing a product with careful appearance, high-quality components and non-resigning power. Although its price is also higher than the current company. The feeling was very positive, although we still had some doubts about how the matt white finish would withstand the passage of time and stain. On the other hand, ConceptD 9 is a laptop with a 4K screen that is rotated so that it can be used as a graphics tabletAs a graphic designer team, we think it is interesting, but we wonder to what extent it offers something better than having a laptop on one side and the other on the other side of the Wacom graphics tablet. Years ago Acer had the well-known brand "Aspire", but now this strength has been weakened by the appearance of Nitro, Predator, Spin, Swift, ConceptD … too many brands? "I would agree with you if you do not create value, but not if you create a product line with a clear and attractive proposition." And does Acer have this distinction? "ConceptD is designed for developers, Predator for players, Nitro for more casual games, Aspire is a range of generic laptops, Swift is portability, and Spin is exchangeable. for example, yoga. " Screens calibrated by Pantone, but what about HDR and OLED? One of Acer's main claims is that their screens are approved and calibrated by Pantone, which ensures a good level of color accuracy. This applies to ConceptD laptops and monitors, focused on designers. But Gaming laptop screens focus on reaction times as the main advantage. With a 3 ms and 144 Hz screen, the Helios 700 wants to be the best option to play. But we do not have an HDR 4K panel, because the 43-inch CG437K-P monitor. "There are several technologies that we must choose according to demand and establish a good balance of costs." This also applies to OLED screens. In the past, CES has already seen producers such as Razer, Samsung or Lenovo on this panel, but because Acer is still an OLED patient"We conducted this discussion with the team and noticed that there are several competitors who come with them, but we still need to determine the level of maturity of this technology." "In general, when we have new technology, there are two options: one is to seize the opportunity and bet on it to bring it to market one and the other to see if the benefits justify a high cost," explains Massimiliano. Will we see the Acer smartphone again? Four years ago, Acer surprised us with the Acer Predator 8 tablet and the Acer Predator 6 gaming smartphone. long before the new wave of gaming devicesBut the truth is that they have not triumphed enough and it seems that Acer has learned this lesson and does not want to repeat it. "We do not have plans to enter the" smartphone games "market"Massimiliano is so direct when we ask him about this new trend. "A few years ago, we decided to move away from this trend and we do not believe that there is a business model and scale competing with large manufacturers of mobile phones, such as Samsung, Apple or Chinese brands." Y as an example, nothing better than one of your direct rivals"One of our competitors is suffering a lot from pressure from smartphones." This does not apply to ASUS and devices such as ROG Phone. Vice President of Acer EMEA does not believe that there is a real mobile games market, although in this case it is a personal opinion. "Is there a real need for mobile games so that we can perform the second generation of Predator 6? ", He asks. "At the moment, we do not have any mobile device in which specific gaming technologies could be used". "At the moment, we do not have any mobile device in which specific gaming technologies could be used". It is virtually impossible that Acer will present mobile games this yearalthough this part of the interview ends with a reflection on cooling technology and how another device, almost hybrid, can offer good experience. "We are number 1 in Europe on the Chromebook market with over 30% education." The Acer catalog is quite large and includes all kinds of laptops. Among them one of the most commented products during our interview were Chromebooks. Acer thinks that Chromebooks are a great solution for education and exploration options to increase the quality of these products, focusing also on the business world"We are number 1 in Europe on the Chromebook market with over 30% education." In the case of tablets, there does not seem to be such a clear strategy. "The price of Android tablets has dropped." A situation that, for example, led to Acer not being able to provide us with any information about this event. Battery and mobility are still important for Acer and, for example, they showed us TravelMate P6 with 20 hours of autonomy. Is it possible that you are using Qualcomm chips for your laptops? "A proposal to have a battery all day long, which we are interested in, but our solution, we think, adds further problems and is that we can achieve levels of autonomy over 12 hours with current processors." How we see from Acer are closely related to Intel although they do not close any doors well; "If the market explodes tomorrow, we'll think about it." The Qualcomm proposal for Windows is interesting, but thanks to the current processors, we can achieve a high level of autonomy. " How does Acer stand before the emergence of Chinese producers such as Black Shark and Xiaomi on the mobile gaming market? "I do not think that the sale of" games "is enough to have" gaming "products, there are many more values ​​than just a combination of a processor, graphics processor and offering it at a low cost, of course there is a way to distort the market. It is thanks to the price, but it is not a strategy that can lead you to a solid position in the market, especially in the premium segment, users value the brand that invests in their products, I believe that with Predator, we have a brand where the user feels emotionally connected there are many more values ​​than NVIDIA graphics or the Intel processor we introduced. "